Whether you’re an avid meditator—or aren’t quite sure you know what ‘mindfulness’ means—Awake at Work will guide you through the process, showing you how the simple practice of mindfulness can help you tap into your own innate wisdom, insight, and resourcefulness. Access to the Awake at Work Community: A supportive, on-line community where you can share your questions, musings, and wisdom, while connecting with others on the mindfulness journey. Get an exclusive 17-minute session for free. 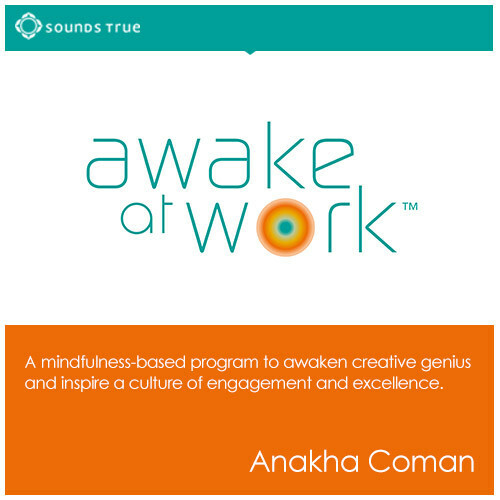 Visit www.AwakeAtWorkTraining.com to receive “Awake at Work: How Can I Realize My Full Potential?” a free session addressing mindfulness, neuroscience, and how a course like this can transform your work-life experience. Based on her extensive work with Fortune 500 companies, renowned mindfulness teacher Anakha Coman skillfully and generously offers the same revolutionary insights and straightforward tools that have helped inspire dynamic innovation at an elite group of leading-edge corporations. Whether you’re an avid meditator—or aren’t quite sure you know what ‘mindfulness’ means—Awake at Work will guide you through the process, showing you how the simple practice of mindfulness can help you tap into your own innate wisdom, insight, and resourcefulness. Through comprehensive lectures, illuminating journal exercises, and supportive, easy-to-learn meditations, this 9-week series will enable you to find focus, creativity, and true fulfillment at work. Anakha's Mindfulness practice has profoundly impacted my personal life, my family life, my work life, and my recreational life. That's really the key -- to be more awake, aware, present in all of my life, and more connected with the lives of others. The benefits are too many and too deep to list. Anakha has worked with multiple major corporations, bringing Mindfulness practices into the workplace across the US. I had gone through other "leaders in the field" books and practices before finding Anakha. Yes, of course she has studied broadly to select the material and practices that have been demonstrated to be most impactful. I see this as a tremendous gift she brings. She has put together a wonderful synthesis of available insight, and woven it into an effective experience. I was part of her work at a major company, and have followed up with this online class.